You know how the first time you tried out your new lightweight lithium-powered screw-gun it blew your mind as to how strong it was? And how you grin when you effortlessly yank a trailer with your diesel pickup? 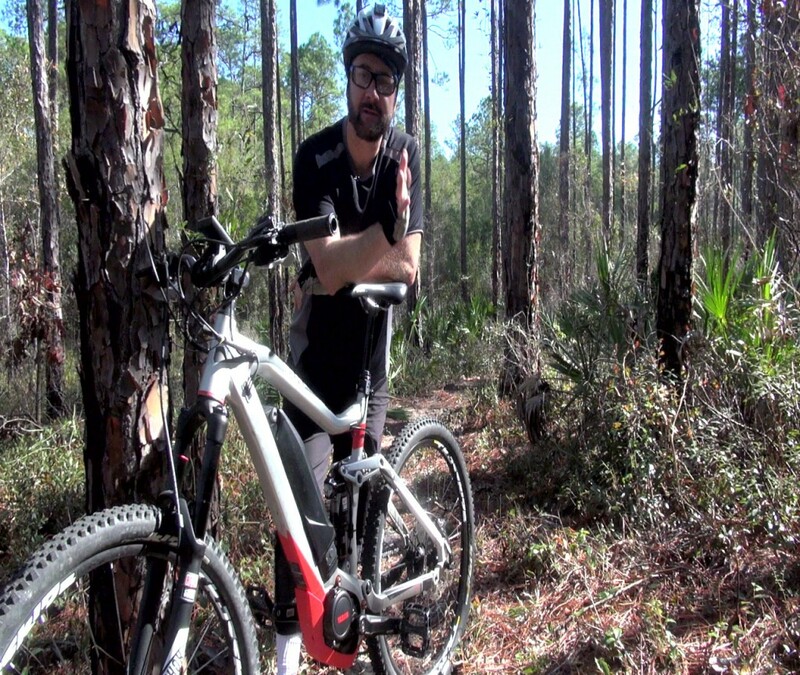 Well, that’s kind of how I would describe this 2016 Haibike Sduro All Mountain Pro eBike. First off, make no mistake, the name: HAIBIKE, no it’s not a fly-by-night made-in-China knockoff, like some of the ATVs we’ve had to deal with in ATV industry over the years. Haibike is quite the opposite. Think more on the lines of Mercedez Benz, the made in Germany manufacturer has been at it for 20 years and they’ve been making ebikes since 2010. 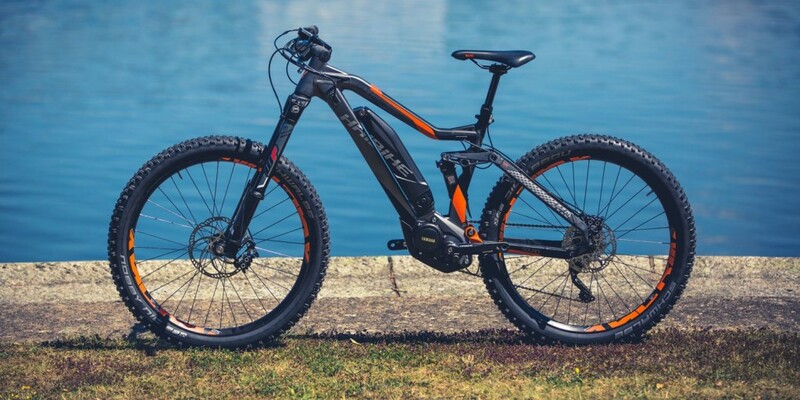 In fact they’re the pioneers of the e-mountain bike, and with 48 unique models to choose from this year they mean business. 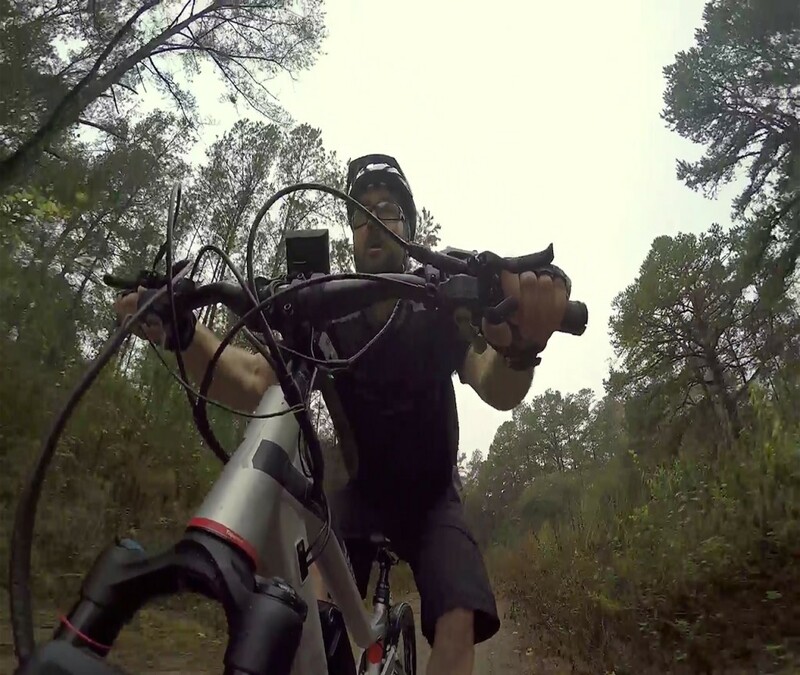 I’ve been riding off road bicycles since I was 10, but never in my life have I been more into mountain biking than now, and it’s all because of Haibike’s incredible piece of off-road equipment. I’ve been riding the hell out of this bike for the last four months. I put about 500 miles on it and enjoyed epic rides from Ohio to Florida and all states between, so I have gotten to know this bike quite well, and I have to say we’ve become best of friends. The fact that I don’t turn down even the slightest chance to ride it says a lot. Combine the 68-degree head-tube angle and the relaxed frame-geometry with a compact smaller wheel-base and it’s a bike that’s simple and comfortable to ride for all-day-adventures. This also makes it a very nimble bike, which is great for carving through tight wooded terrain found in my neck of the woods out east. 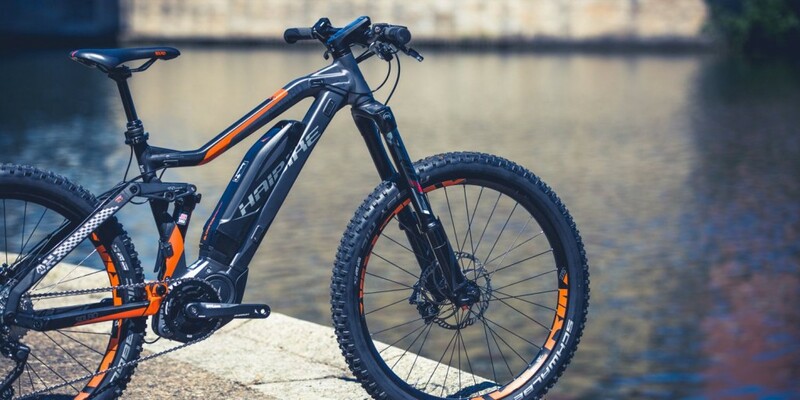 At 48 pounds it’s heavy, no doubt about it, but the weight is balanced well and with its low center of gravity it almost helps the bike to stay planted – just drop the seat, get aggressive and let the Rock Shox electronic-intelligence suspension do its thing beneath you. The great rear shock is only half the reason this bike soaks up bumps like the best of them, besides carefully engineered frame geometry and construction, the Haibike sDuro uses the best 4-link suspension system the industry can offer. The bike does have sort of what I would call I high front-end. 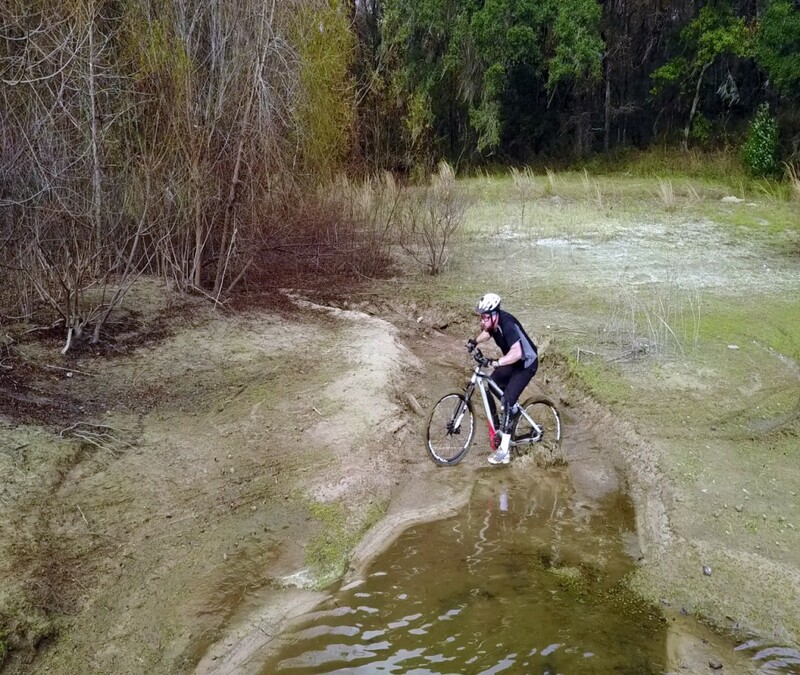 This lets you ride longer with less fatigue but the trade-off is you’re sort of riding on the bike instead of being a part of it (like you can with an aggressive racing-type of mountain bike), so there’s a bit of a twitchy stand-over feel at times. The solution is to use the dropper post. This instantly puts you in a much more aggressive position and provides a longer more control-able reach. The Kind Shox dropper that comes with this bike is your best friend, especially on this particular model. 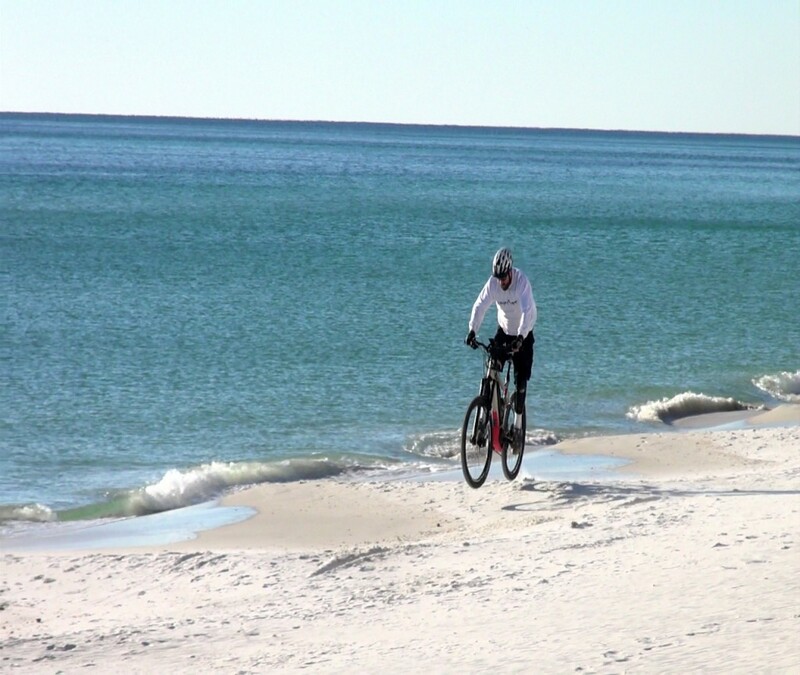 I use it all the time – it really allows this bike to be two bikes in one. With the seat up the relaxed geometry lets you cruise all day like you would on a plush 4×4 utility quad, but with a stab of the dropper you’re instantly in a charging position, like when you wick up a high performance 450 sport quad to tackle jumps or gnarly terrain. Since you’re riding a bicycle with an engine there’s definitely a needed control pad and display. Thanks to Yamaha both are lightweight and well thought-out. You can rifle through the four modes while riding without even looking – just press the control pad located on the left side of the bar. You can get to it with your left thumb, up to increase and down to decrease how much assistance you want. The control pad also includes a walk assistance button and a handy 5-volt mini usb for charging your phone, listening to music, or plugging in a GPS unit. As for the display you can easily view total distance, trip distance, time and trip length as well as max, current and average speed. There’s also a battery indicator that spits out a pretty accurate estimate of how many miles you can go based on the amount of power you’ve used during the last four miles you’ve traveled. 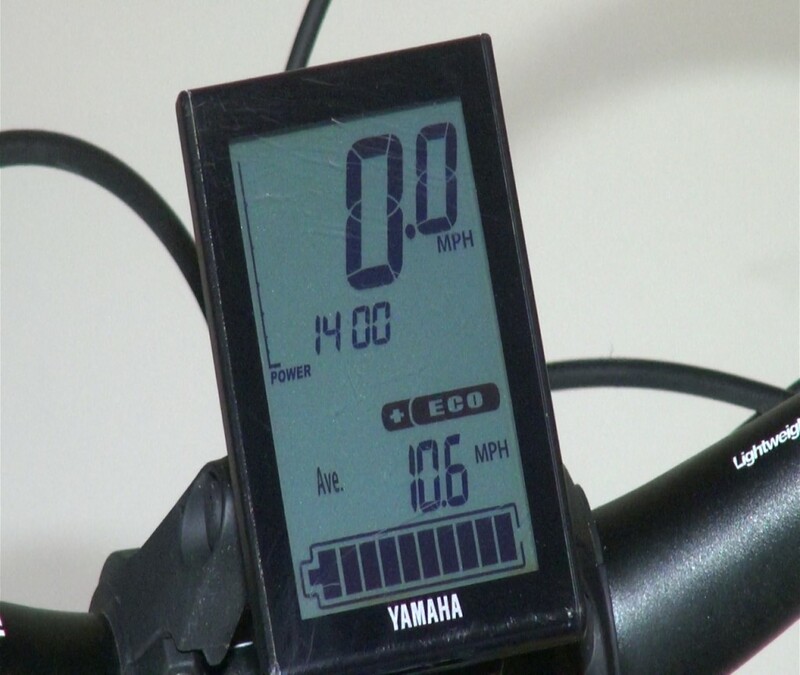 Yamaha even included a meter than measures the assistance level of support. Slide the display unit onto the mount bracket and it clicks nicely into place while it plugs in. I love the fact that the lightweight mounting bracket swivels nicely on rubber sleeves, so the unit rotates just where you want it out of sun-glare, and has some give in case you crash. Best part, the display easily slides off just as easily. Grab it and slide it off, simple as that, this way you can easily remove it from the bike so it wont be stolen or damaged during transport of the bike. In 500 miles of hard riding and little maintenance, I’ve had very few issues. I’ve gone through three chains, and since I didn’t replace the rear cassette when I replaced the last one, I’m spinning the chain on the gears and that led to a crazy error that stopped my riding until I could figure out how to remove the error. Rather than take the bike to the dealer to clear the error, I just searched on YouTube and found this nice little video explaining which buttons to press at the same time to clear it. It took three minutes and problem solved. Chances are you’ll never get the error in the first place if you simply ease up on the pedals if you experience the chain slipping. I’m always hard on whatever bike I’m testing, and purposely didn’t ease up when this chain-slip happened to me. No. This is not a cheater bike. If you think it is you should ride one to better understand its purpose and all that can be done with one of these modern-day eBikes. I can go farther and see more of God’s awesome earth. Hills, even mountains aren’t painful, they’re fun! I’m not worn out and spent for the rest of the ride after climbing one big hill. And with the higher speeds I’ve become a way better rider by riding this bike. It’s crazy but since I got this Haibike I’ve had the urge to want to ride conventional mountain bikes more than I ever have. The real cheating going on here is the fact that I’ve had 500 miles worth of epic adventures and haven’t changed the oil, adjusted the valves, swapped a clutch, cleaned the air filter, packed the silencer or put a new piston kit in the bike. I ride for sometimes 40 miles at a time, when I’m done I lean the bike on the garage wall and walk away. It seems too good to be true but the Yamaha engine has provided unbelievable fun with very little maintenance. What’s more, compared to ATV and Side by Side rides, riding this bike as been extremely simple, there’s no hassles, the neighbors don’t complain, ride spots are all over the place – just pick up the bike, put it in the truck and off I go. Not to mention, I can wash the bike in five minutes. The 2017 version has some changes that you need to know about so you can decide which bike is better for you. For 2017 Haibike changed the rear shock angle, went with a steeper seat angle, and their revised frame allows for a little longer wheel-base. This makes the 2017 a little more of an aggressive riding feel than the 2016 that I’m reviewing here. The new 2017 SDURO uses a new Fox Float EVO rear shock. Before you get excited it’s not electronic like this Rock Shox Monarch electronic-intelligence system is. The FOX is a great shock, I happen to know FOX equipment well, so there’s no doubt it’s a great choice, but I’m too in love with this Rock Shox EI system and would hate to part with a system that changes from full open to half open to closed by reading the terrain so you don’t have to even think about making changes while you ride. Besides the Yamaha engine, this EI system on the 2016 model has been my favorite part of the bike. 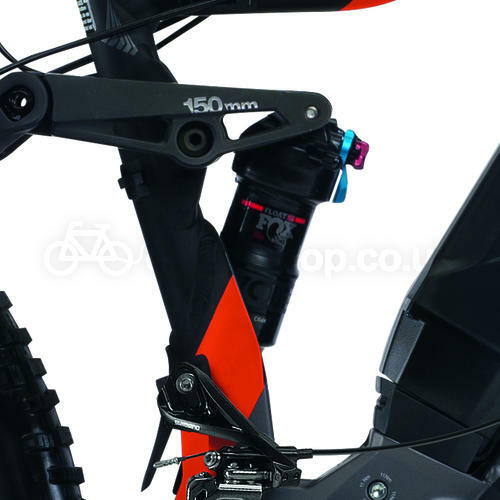 I believe the swap was made because the new 2017 Yamaha-powered All Mountain Haibike has a new integrated display incorporated into the head tube where the Rock Shox Monarch dash controller needs to be mounted. 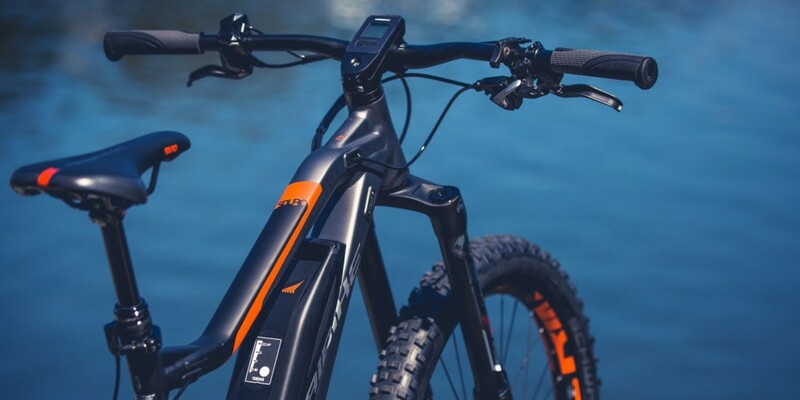 So you’ll have to decide which is more important to you, an electronic rear shock or a smaller sleeker display unit that’s now more out of harms way. 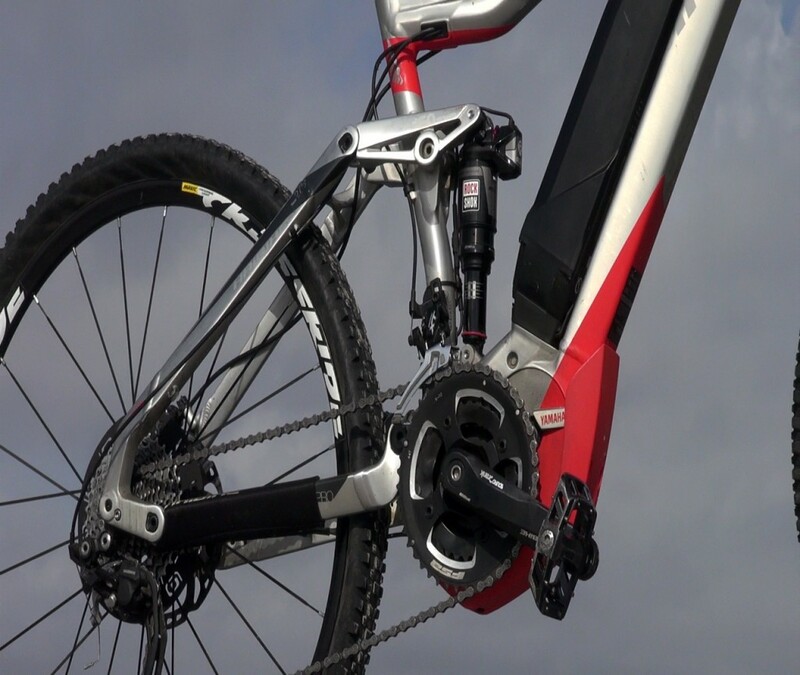 As for front suspension changes, Haibike went with special made-for-the-eBike-scene Magura upside down forks that are said to be better than the Rock Shox Pike system found on the 2016 bike. For the record I thought both the front and rear suspension were outstanding, so although I didn’t ride the 2017 version, I’m going to say either the 2016 or the new 2017 suspension will have you smiling every time you ride. Nice wide three inch Schwalbe Nobby Nic’s are mounted to XLC 40mm Rodi wheels. This tire and wheel package is impressive and in my opinion a huge improvement from the 2.25” Mavic wheels and tires found on the 2016 sDuro. Wider tires are a great improvement, I have to admit I’m a little jealous about this upgrade. 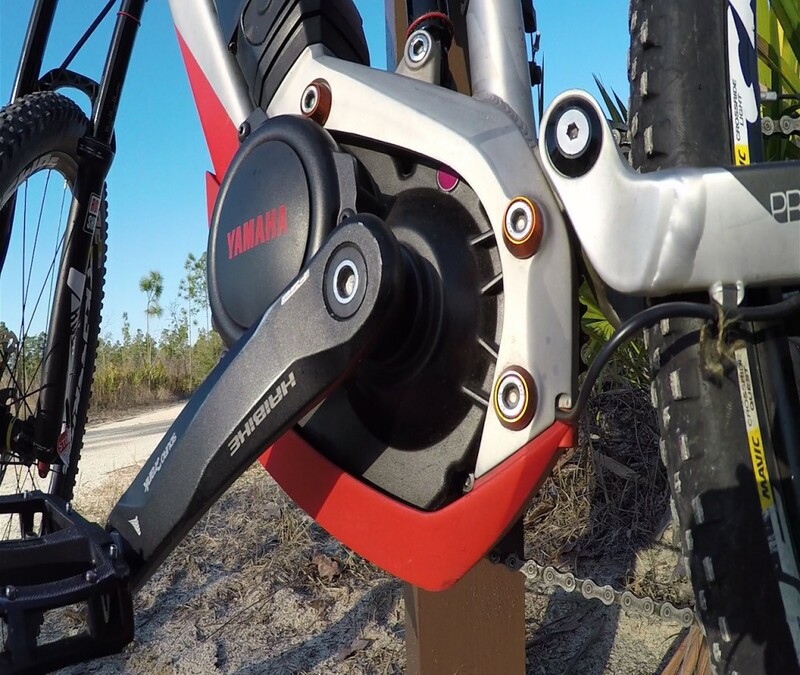 The 2017 uses Magura brakes rather than the Shimano Deore XT brakes on the ’16 model. Also a Shimano XT gear package is used instead of the Shimano Deore XT on the 2016 bike. Both use the same 2×10 setup but they’re going with a new rear cassette with an 11 to 40 tooth range, up from the 11 to 36 on the 2016 sDuro. Also the 2017 model comes with Yamaha’s new PW-X series motor system. It’s 11% lighter because they decreases the size of the cases and hallowed out some of the axles in the engine. The new motor offers a touch more assistance it’s said to make 80 newton meters of torgue compared to the 70 this bike produces. And the new Yamaha battery is up from 400 watts to 500 watts, but the two batteries are reverse compatible, so you can upgrade to that battery and get a little more range with this 2016 bike. Also if the 2017 sounds more your style – it’s now called the sDuro AllMtn 8.0, they dropped the word Pro, all their bikes are now using numbers to replace the letters that they used to use. Numbers 1.0 to 9.0 makes it easy to understand the level of on board components. So if you’re thinking of getting the top-of-the-line Yamaha-powered eBike you need to look closely at both the 2016 and the 2017 sDuro models and decide which is best for your personal needs. The new 2017 is a little more aggressive bike than the 2016 is. If you’re not the hard-core racer-type and you ride a lot of tight single-tracks or plan on going on a lot of long point A to B casual rides – maybe every day trail riding is your thing but you still want a bad to the bone bike, you might opt for the 2016 version of the Sduro, and you’ll save money by going this route as well. The 2016 Sduro All Mountain Pro retails for $6199, I’ve seen them as low as $5800, but now that the 2017’s are out you might be able to pick one up for cheaper. And if this is still out of your budget, you’re going to have to settle for a lesser specked-out bike. Since these bikes aren’t absolutely brand new anymore, I think you’ll start seeing good used eBikes on the market within the next year or two. As for now, finding a good used one is a challenge since nobody wants to part with them, and I don’t blame them – the e bike revolution is on and everyone wants these incredible machines, especially the cream of the crops like this Haibike. Lastly Haibike’s warranty is pretty good. You get an impressive 5-year on the frame, 2 year on the motor, including the battery – and one year on all the components. I’ve owned and borrowed several top-of-the-line mountain bikes, but this was my first eBike. I have to say I’m impressed with Haibike. 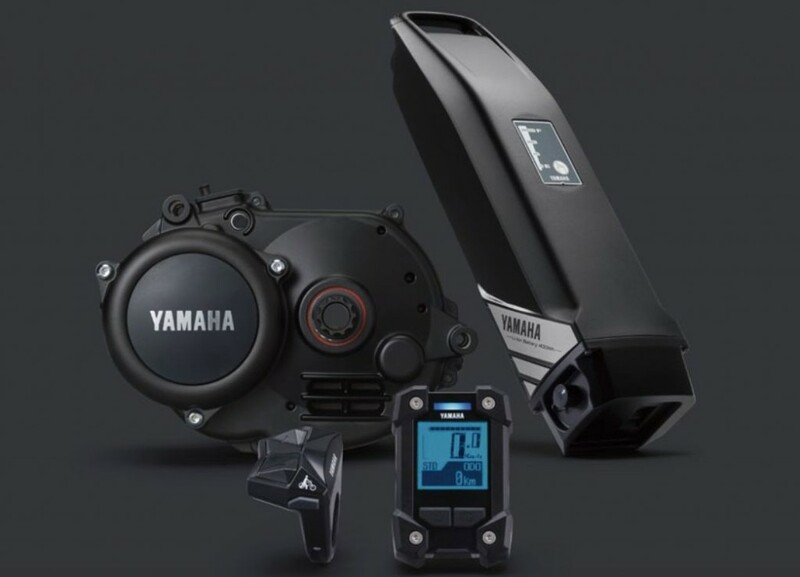 It’s obvious they have worked closely with Yamaha, who by the way has been making mid-drive electronic bicycle motors since 1993, to create a high-performance well-thought-out high-quality bike. Build quality is just as impressive as to how sharp the sDuro looks. As for riding it, the most important part of any bike, you must try one for yourself. If you’re like me you’ll be hooked. It’s bicycle meets dirt bike without the weight, noise and hassles. More on my favorite part of this bike, the Yamaha PW Series engine… In case you didn’t know, Bosh engines are used on Haibikes xDuro line, while all of their sDuro bikes use the Yamaha engine. There are a few reasons I like the Yamaha more than the Bosh. First off the Yamaha utilizes their Zero Cadence Take-Off technology. As soon as you start pedaling you get assistance, you don’t on the Bosh drive. This is great for tight trails and hills where you can utilize the smooth diesel-truck-like low-end power that the Yamaha delivers. Since there is no throttle the engine delivers assistance based on your cadence, the torque you’re applying to the pedals and current wheel speed. This data is measured every tenth of a second. The end result is a smooth seamless noise-less power delivery that will undoubtedly make you grin with every pedal pump you provide the bike. Trust me it’s addictive! The Yamaha engine runs at 36V, 250 to 500 peak Watts, makes 70 newton meters of torque (the 2017 sDuro makes slighty more at 80). They Yamaha seems to make its power on the bottom while the Bosh makes its power on the top-end, and you can tell the Yamaha is more torquey, and better for lower speed tight terrain, while the Bosh offers faster speeds and doesn’t seem to sign off at higher RPM like the Yamaha does. I also like that the Yamaha uses a traditional drive chain (there’s actually two of them on this bike – making it a 20 speed), the Bosh uses its own small drive gear that requires a chain tensioner. You can go about 40 to 100 miles on the Yamaha engine using its 400 watt battery. I’m told you can’t go quite as far on the Bosh system. The Bosh does offer Shift Sense Technology that tells the engine to ease off while shifting, and the Yamaha does not have this, you’ll have to remember to back off a bit while you shift, just as you would while shifting a conventional mountain bike. Lastly sDuro models are about a $1000 cheaper than xDuro Haibikes because Yamaha’s engine is less expensive. 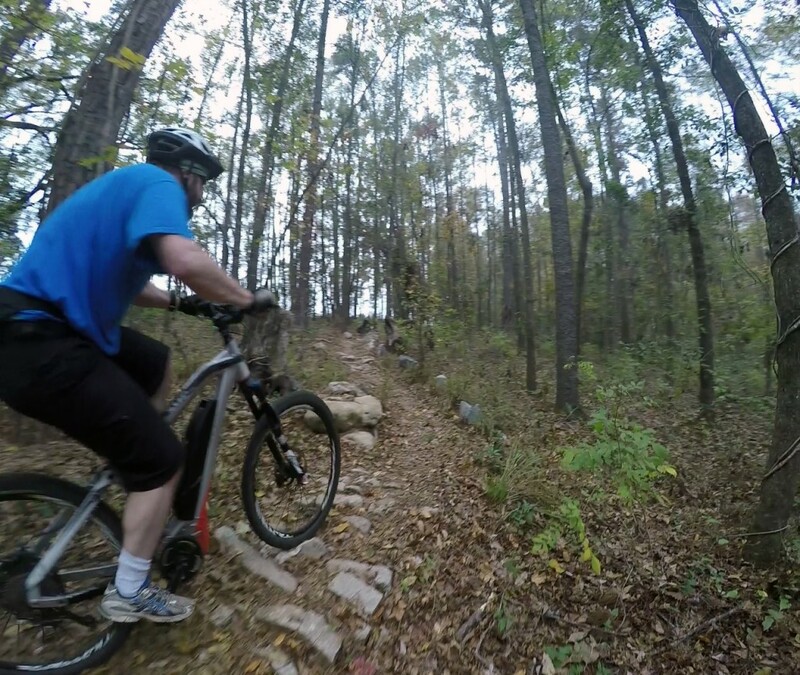 Originally I thought the best part of riding this bike would be how I could effortlessly climb hills, go farther and enjoy more terrain than I ever could on my regular bike, what I didn’t expect is just how well the Haibike handles downhill terrain. 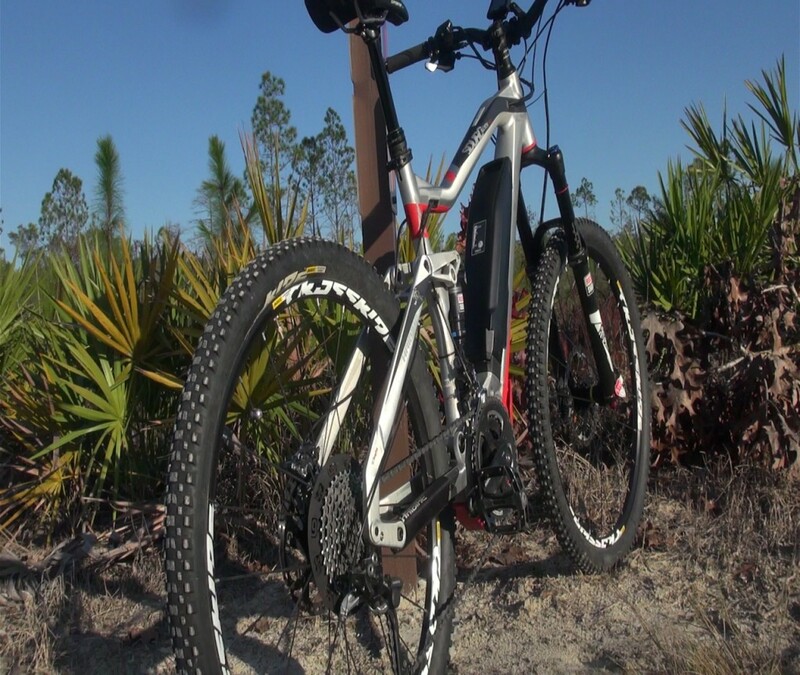 It’s much heavier than high-end mountain bikes but the weight is low and centered. With this, the bike seems to have more of a planted feel especially when cornering and traversing through the rough stuff. The Haibike sDuro All Mtn Pro has provided more epic adventures than I could have ever experienced on a conventional bike. I can simply go farther, see more sites and aggressively bomb more fun singletrack downhill sections than ever. 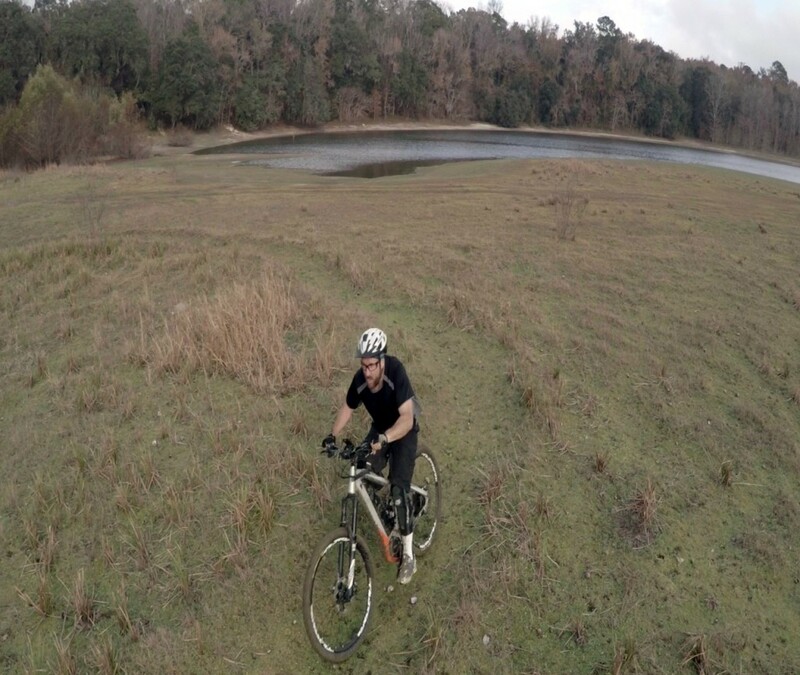 It’s also made me want to get out and ride more than any other bike I’ve had, thus I’m in better shape now than before I had it, so much for calling it a cheater bike. I’ve also enjoyed showing it off to friends and family, most had no clue eBikes even existed. Everyone I’ve offered a ride to has taken me up on the offer because it’s not intimidating — just get on and ride it just like any other bicycle. And if the person is short, no problem, just stab the dropper post button and lower the seat to their ideal spot and off they quickly go with ear to ear grins every time. In short, I couldn’t be happier with this bike! 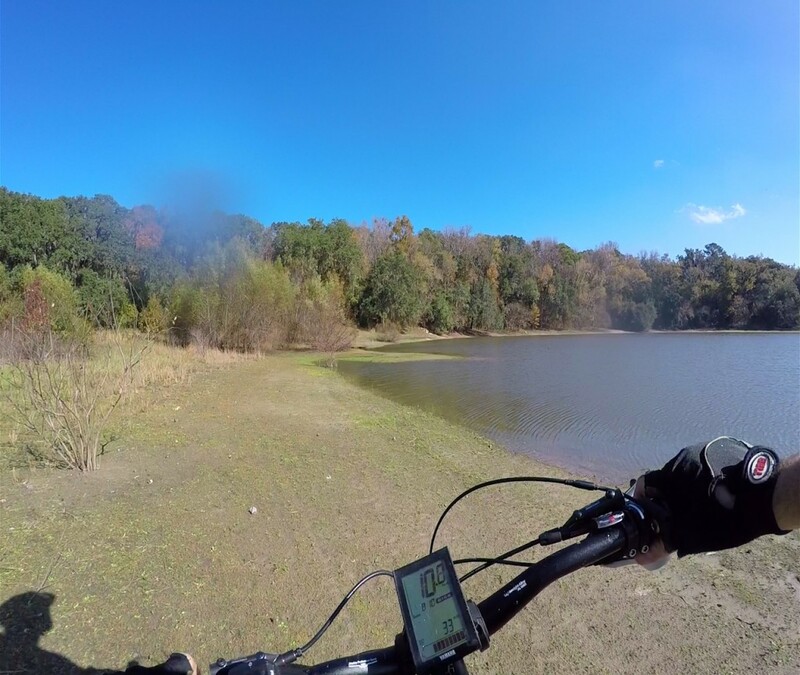 Click over to haibike.com, find a dealer near you and take one for a spin. Let me know when you get yours, I’ll meet you at the trail head with a full charge. 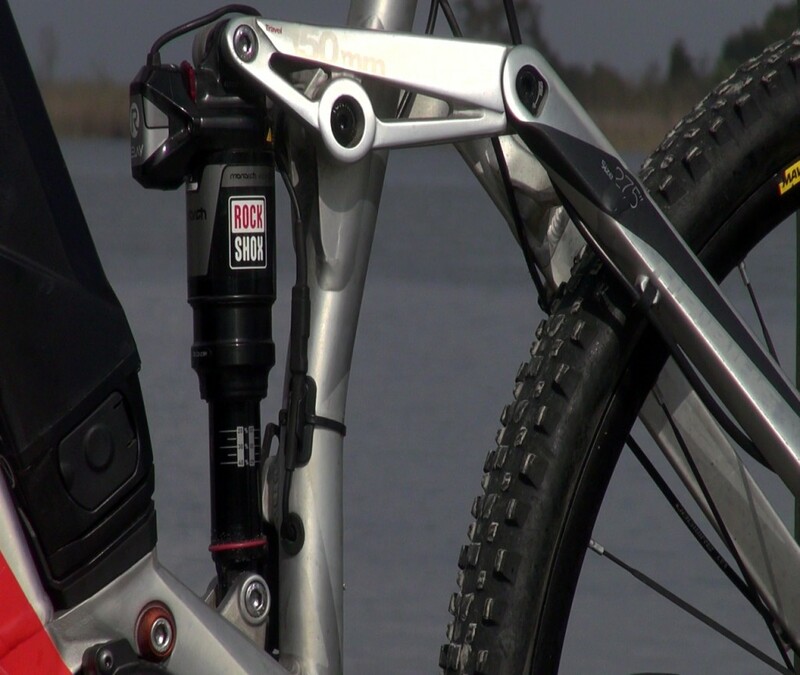 Fork/Front Suspension: Rock Shox Pike RC dual position 120-150mm of tapered trvl.